I was lucky enough to have a few days break a couple of weeks ago – my locum was free to step in here at Liz at Lancaster and friends in Southbroom down on the South Coast had agreed to have me to stay for a few days. So I set off on the road down the N3 to Durban on a clear Highveld autumn day. It’s a brilliant road in great condition and although there is lots of maintenance on the go, there are no ‘stop-go’ road-works. Getting away early from the guesthouse is always difficult, so I left around mid-day and broke the trip with a stopover in the Midlands. Debbie Hayes used to run 42 on 2nd, a great guesthouse in Parkhurst, and like Liz at Lancaster was part of the Rosebank Region Accommodation Association. 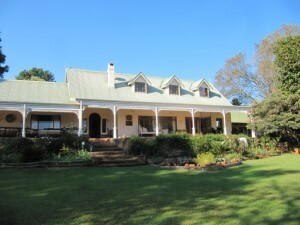 After selling and moving to the Natal Midlands she and her husband opened up a two-roomed guesthouse on their fabulous property near Dargle. Hambleden is a delight – it’s quaint, charming, peaceful and picturesque. After dinner catching up with Debbie and Simon, I slept like a baby in a wonderfully comfortable bed with great quality linen. 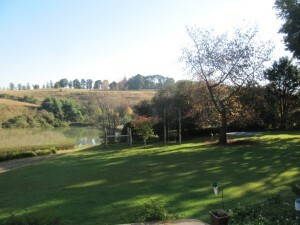 For a townie like me it was sheer heaven to sit on the stoep in the morning sun and look over the dam in the front of the house and to the cows in the field to the left. 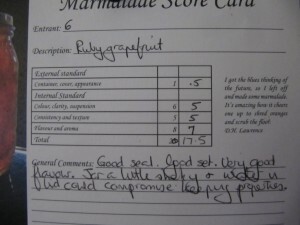 I even managed to buy the last 2 bottles of Debbie’s homemade Ruby Grapefruit marmalade. As you can see from the score-card, Liz at Lancaster guests will soon be enjoying marmalade bought directly from the champion marmalade-maker herself! After a wonderful ‘English’ breakfast at Piggly Wiggly, a visit to the amazing Mandela sculpture at the site of his capture on the R103 ( See next post ), and an impulsive splurge at a Belgian chocolate shop (under the pretext of course, of a buying something for my hosts in Southbroom), I was on my way again. Thanks Debbie and Simon for a great stay. If you will have me, I’d love to be back to explore more of the Midlands Meander. Liz, we loved seeing you and you are welcome back to explore more of this beautiful area whenever you can get here! Marmalade bottling season is about to begin! Thanks Debs. Might take you up on this as would love to meander more in the Midlands. Would love to got to Ardmore and also to Caversham Press.